Have HP made this netbook a bit too 'premium'? 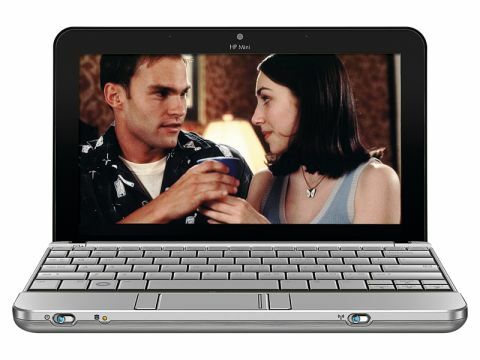 HP's flagship netbook is the extremely smart Mini 2140. Crafted from brushed aluminium and silver plastics, it certainly makes a visual statement, but performance is sluggish due to the fact it runs Windows Vista. The 10.1-inch screen is bright and produces strong colours. It is encased beneath a sheet of glossy plastic which runs edge to edge. While it looks great, screen reflections are greatly increased. The keyboard is one of the best available on any netbook and, being 92 per cent full-sized, is extremely intuitive to use. The touchpad is comfortably large, and features a scroll pad for easily browsing through documents. It also features a hotkey to disable the touchpad, should you find yourself brushing it by mistake during typing. Frustratingly, the mouse buttons flank the touchpad rather than sit below it. As a result, they are quite awkward to use. In a bid to provide maximum functionality to the business market, Microsoft's notoriously resource-heavy Windows Vista Business operating system has been used, rather than Windows XP. Despite 2048MB of memory onboard, the machine struggles, and is slow to run. Storage is strong, however. The 160GB hard drive provides plenty of room for all your work and multimedia libraries. While the 141-minute battery life isn't great, the chassis weighs just 1.2kg, so this machine remains mildly portable. Connectivity is fantastic. The integrated 802.11n Wi-Fi provides high-speed wireless connections to hotspots, while the integrated Gigabit Ethernet card also provides the fastest possible wired connectivity at home or in the office. Two USB ports are included, and supplemented by a VGA-out port for connecting to a larger monitor. Unusually for a netbook, an ExpressCard slot is also in place, for adding peripherals. With plenty of style and all-round usability, the HP Mini 2140 is certainly a great little netbook. However, performance isn't quite up to scratch and it doesn't come cheap, meaning, overall, we prefer the Mini 110c.